How do you hold on to hope when you don’t get the ending you asked for? 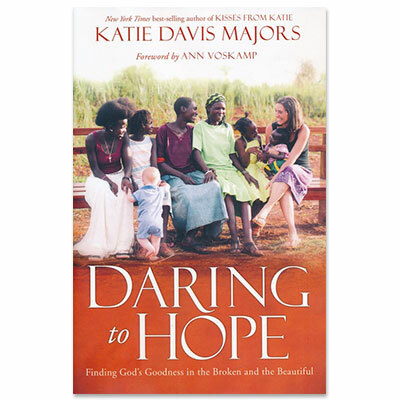 When Katie Davis Majors moved to Uganda, accidentally founded a booming organization, and later became the mother of thirteen girls through the miracle of adoption, she determined to weave her life together with the people she desired to serve. But joy often gave way to sorrow as she invested her heart fully in walking alongside people in the grip of poverty, addiction, desperation, and disease. After unexpected tragedy shook her family, for the first time Katie began to wonder, Is God really good? Does He really love us? When she turned to Him with her questions, God spoke truth to her heart and drew her even deeper into relationship with Him. Daring to Hope is an invitation to cling to the God of the impossible—the God who whispers His love to us in the quiet, in the mundane, when our prayers are not answered the way we want or the miracle doesn’t come. It’s about a mother discovering the extraordinary strength it takes to be ordinary. It’s about choosing faith no matter the circumstance and about encountering God’s goodness in the least expected places. Though your heartaches and dreams may take a different shape, you will find your own questions echoed in these pages. You’ll be reminded of the gifts of joy in the midst of sorrow. And you’ll hear God’s whisper: Hold on to hope. I will meet you here. Katie Davis Majors moved to Uganda over a decade ago with no idea that this would be the place that God chose to build her home and her family. Today, she is a wife to Benji and mom to her fourteen favorite people. Katie and her family invest their lives in empowering the people of Uganda with education, medical care, and spiritual discipleship. She is also the founder of Amazima Ministries, an organization that cares for vulnerable children and families in Uganda and the author of the New York Times bestseller Kisses from Katie.